Andrew R. is a well known Canadian entrepreneur and investor, co-founder of a revolutionary online software company, and of a provider of online casual games and fantasy sports. 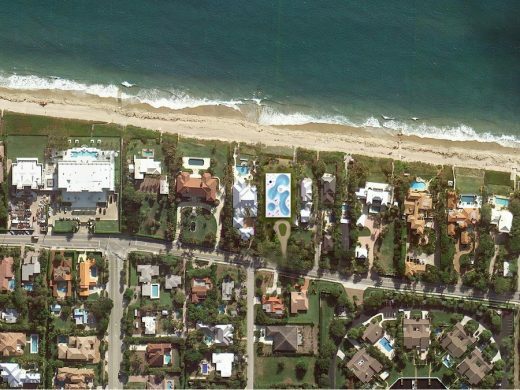 Andrew purchased a property in Del Ray Beach, Florida and planned to replace the existing 12,000 square foot mansion with a smaller home of 8,000 and guest house of 4,000 square foot. “I would like to have built for me a unique home that reflects the achievements and success of my business endeavors”. Clearly a potential dream assignment; we immediately started drawing… We prepared a ‘sketchbook’ that intended to catalyze the design process. All proposals took the required pool as starting point. It occurred to us that most pools, however enjoyable, are just fairly standard, lack imagination, their design surprisingly uninspired…There is a world to win! 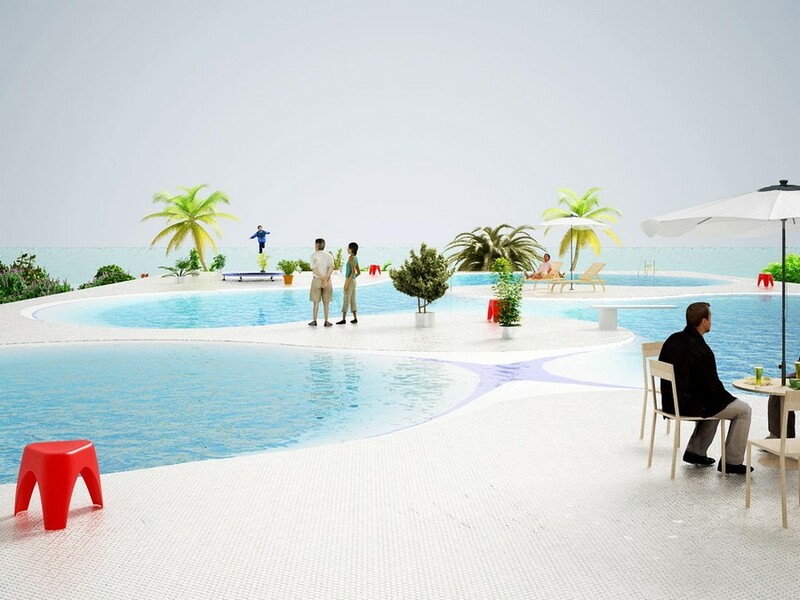 Sketchbook investigates what new role the swimming pool could play in designing a home. Could the Pool serve as a more fundamental ingredient of the contemporary mansion? Could we imagine a ‘mash-up’ of Home and Pool? Pool House features a free form swimming pool on the roof. The roof pool in a way doubles the plot. It creates an additional usable level, an elevated private square. The ceiling of the house below follows the graceful geometry of the pool creating a sensational sequence of inverted domes: a cozy grotto comes into being. Perhaps the pool on the roof can serve as a device to reduce the energy use for air-conditioning…a house with water-cooling. A very cool house for sure. SAWA* House suggests to create an artificial ‘hill’; the height-lines create terraces inspired by Balinese rice paddies: a valley of cascading pools! The interior that results from the abstract slopes is spacious and open to the garden and the sea view. Here and there rooms open up to the stunning landscape of pools on the roof. SAWA* House could become an inhabitable version of the Pamukkale hot springs. “I am looking for a luxury beach front home which has a modern take on contemporary design”. Drop Blob is a Kidney Shaped Pool House. 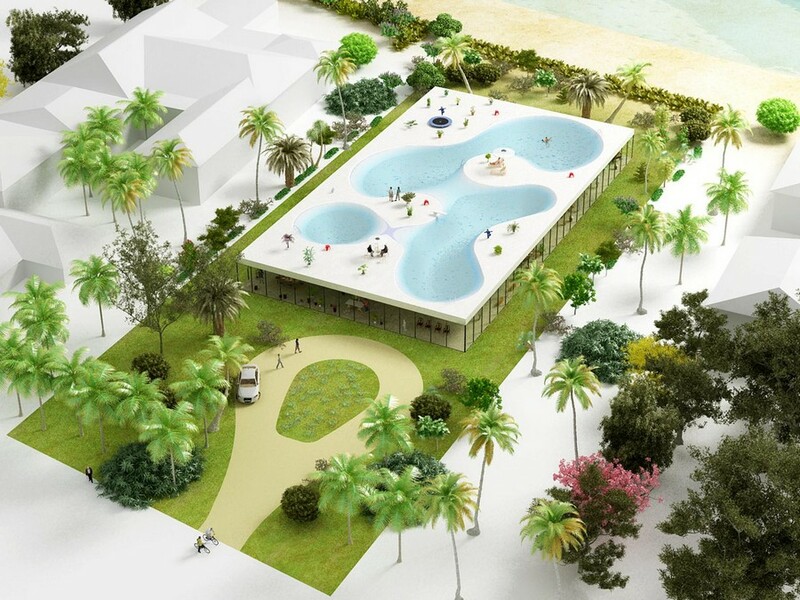 The proposal consists of an intricate ‘estuary’ of kidney shaped pools that form the roof. The elongated house follows the shape of the pools, creating a ribbon of unique rooms below the water level with outstanding relationships with the surrounding garden. The pool flows over the roof edge to create the sensation of endlessness. The water cools the facade. Chill!